Ok.... last post for the day.... prolly for a WHILE! LOL!!! Goodness.... i'm on a binge it seems! VBG! This is for my friends husband who plays Buffalo Bill. I was really challenged to find the right colors to work on black but stay true to a buffalo. Think I did ok tho. Hope he likes it! I've posted some things that i've done before. I do some work for a couple of re-enactors (western history buffs). 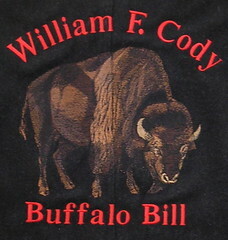 Anywhoo, this is one buffalo I just stitched for them on a vest. Its to be a giftie for one of their dear friends. Came out pretty well I think! This is the beginnings of project I WILL finish! LOL!!! Actually I will because of what if means to me. This is a center diamond that will act as the medallion of a small quilt. The surrounding cq blocks that I will attach will all have scans of leaves, trees, etc. This is The Forest Within. I did a TON of fabric manipulation here and am now in the process of beadingand embroidering this baby. In the upper section you will see a clump of beads...well, its a poppy that worked GREAT for the sunset and i'm seeing the flower IN the sunset so i'm playing that up. Makes no sense probbly, but its where my brain went, so there you have it! LOL!! Mountains are figuring largely in my work these days. They are a part of my soul as I was born here in Colorado. More updates as progress is made! Enjoy! Look at this little gem!!! Linda in NY from CQI made her and I HAD to have her. (I was the swap mama.... hehehehe.... ) Isn't She great?? The face is drawn by hand! I keep looking at it and looking at it....just amazed at the talen. All the stitching as with Jo's and Hidekos is eensy weensy and WONDERFUL!!! Sooo, i've taken the leap and have entered another swap due to complete before Christmas! Ohhhhh myyyy...I just can't wait to see the gems that come out of this one! I was a part of a doll swap over at CQI. This gem is from Hideko!! Isn't she wondrous??? 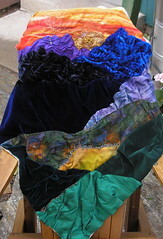 Hideko has SUCH a knack with her marvelous silks and wonderful stitching! All my girls are hanging out with me, acting a my "muses"! I love them all! I just LOVE this little gem! She is a giftie from my fellow group owner, Jo over at CQI. I just adore all the teensy vineys ad leaves and the intricate stitching! She is WONDERFUL and I will treasure her always! Thank you JO!!! Another rr entered, 2 more blocks ready to rock and roll!!! This one is alllll about stitch variations so I tried to make some longer seams! Should be fun to see what comes home! I'm on an inner journey trying to explore and "find" what my purpose is. Expressing myself is a big part of that. I'm trying to figure out what i'm good at and develop it. I LOVE nature and find much to stitch about by just walking out into my garden! I am intrigued with textures and colors and love to see how the plants all blend together into one harmonious symphony of color! I often find myself looking at things differently. Through a different set of glasses as it were. I'm in a more creative mode and I "see" faces or flowers or animals in the swirls of plaster on the wall, horses chasing the wind in the clouds. The colors of a flower share the emotion of their incredible ability to burst with life! Does anyone else see things this way? Anyway.... through all this rambling, I came across a blurb I had saved that was given to me bya friend. I thought that i'd share it. Its a great way to help get past a block and unleash all that talent stored up inside! I especially like trying to draw with my non-dominant hand! WOW!!! The things you can discover about yourself! LOL!! Have fun!! 1. Color. Buy crayons and a coloring book, and purposefully,intentionally, color outside the lines. Scribble, break the crayons in half,smash them into the page. Write in the margins how it feels to break therules. 2. Spend some time thinking about what you loved as a child. Whatcolors, clothes, games, toys, activities, dreams do you enjoy? Which arecurrently in your life? Which have you not seen or enjoyed in years? Make aplan to rekindle some of your childhood loves in your daily life, today. 3. Create with your body. Take a break from the gym and work out at alocal playground. Playing hopscotch, pumping legs on the swings and climbingjungle gyms aren't just for kids! Or try gardening or hiking to cultivate akid-like connection with nature. 4. Draw your goal. Grab some crayons, markers or colored pencils.Imagine a goal that you'd like to meet, and draw a picture of what it willlook like when you've reached this goal. Make it detailed, vivid andkid-like! This isn't about drawing skills - it's about representing a visionin a fun and uninhibited way. When you're done, hold it up proudly and sayout loud, "I DID THIS!" Tape it to your refrigerator! 5. Make a set of "trading cards." 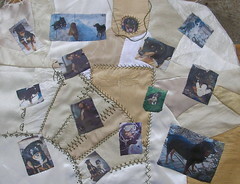 Cut out images that you love fromcatalogs, magazines or greeting cards. Focus on images that make you feelfull, alive and truly happy. Glue these images, collage-style, to an olddeck of playing cards. This is a project you can work on a little bit at atime until you have a whole deck of cards that inspire you to dream big andlive your fullest life! Don't forget to collage the outside of the pack! 6. Redecorate, kid-style. Walk through your living space and find areas- even small ones - that could use some Wild Child whimsy. Maybe achildren's book belongs with the serious coffee table books. Maybepipe-cleaner flowers belong in a vase on a kitchen shelf. Find corners wherea little smile goes a long way. 7. Imagine new pictures. Find an image from a magazine and tear it out.Place it on a flat surface and turn it upside down. Try to find an image,activity or story in the lines and spaces of the upside-down image. Ifyou're having trouble seeing anything, ask, "If I were a child, what might Isee in this picture?" Doodle with markers and pens to expand on andilluminate your image. Add words, if you are drawn to do so. 8. Write your to-do list on poster boards taped to a wall. Write withmarkers, and with your non-dominant hand (or put the marker in your fist andmake broad, childlike strokes). On one poster, write a list of things youneed to DO. On the other, write a list of things you dream to BE. Movebetween the two, allowing a free-flowing relationship to develop betweenthem. What do you learn about yourself and your priorities? 9. Find a board or card game from your childhood and change the rules.What if CLUE became a game about decorating rooms in Fun House style? Whatif Twister was a massive canvas for art? What if chess pieces were purple,pink and polka-dotted and the game was about cooperation instead ofcompetition? If possible, alter the actual game board and pieces tocelebrate your rebellion against the rules. If that's not possible, writeabout your new rules in a journal. 10. Go on a nature walk with child's eyes. Challenge yourself to makeeach of your senses more open and aware, in the way that a child takes inthe world. Gather interesting leaves, rocks or little flowers. Bring themhome and arrange them to create your own little nature shrine. Not a huge project. Nor an elaborate one. BUT, it IS now complete!!! LOL!!! It only took twenty years, but is now awaiting its frame (specially made by hubby) the at long last to be hung with pleasure after so long in the dark depths of the UFO drawer! I'm just tickled a bit of progress has been made. Now to continue with that and get some others taken care of! I posted a month or so ago about having to help one of my "buddies" over rainbow bridge. My heart has been so sad and there are soooo many ways that I have been seeing that he was such a part of our lives and now there is large void. I HAD to do something for his memory. He was such a special boy!! So, I decided to make a small wall hanging with pics that we had over the years. My....THAT was hard. Now, i've decided that I ought to probably add ALL of his friends that have been with him over the years and will probably have to "grow" this block. That's ok. He's worth it. This project of scanning the pics and sewing them down...and now embellishing the paches has soothed me and helped me heal a bit. More on this project as it moves along. Here we are!! 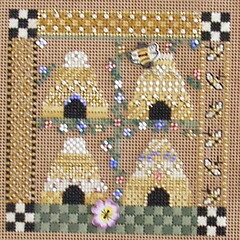 I have completed my work on Jo's block for the Summer Breeze DYB rr!!! I cannot for the LIFE of me get it to load over at yahoo. Sigh... anywhoo, I'm hoping that she likes it! Got an eensy little BEE, some vintage buttons from grandma's button box, some sunflowers that are thread painted and beaded, Miscellaneous seam variations...and... of course, beads! Enjoy Jo!! !